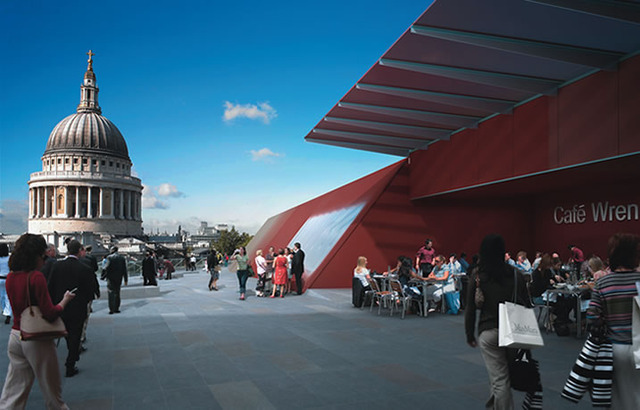 Computer render of the roof terrace. 'Cafe Wren' is unlikely to be part of the finished building. 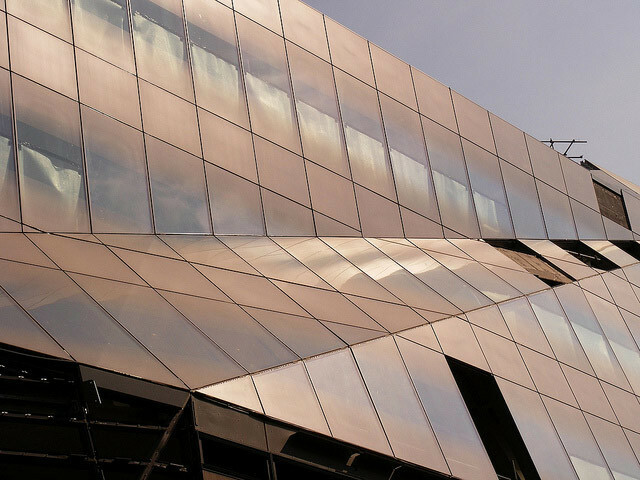 The marketing firm for One New Change, the 560,000sq ft office and shopping complex on Cheapside that opens next month, were all too happy to take Londonist on a tour of the building when we asked. But one caveat: there's no photography allowed on-site ahead of the official opening. Hence the selection of external shots and computer renders presented above. If the ban suggests a paranoid approach, it's a valid one, as the project has earned some heavyweight critics. Serial architectural meddler Prince Charles tried to get architect Jean Nouvel thrown out when he first heard of the appointment. Meanwhile, a forum for residents of the Barbican (itself a project that found public affection difficult to come by at first) are debating what One New Change should be dubbed when completed, with prime suggestions including 'the turd' and, bizarrely, 'the verucca'. 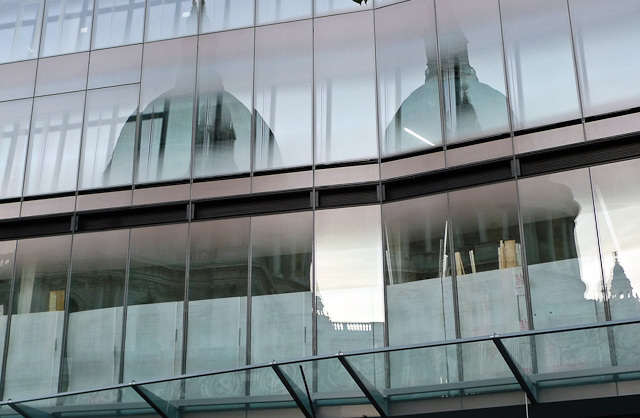 The main objection seems to be the building's bold form — a low-rise, angular, hulking array of thousands of unpredictably angled grey and red glass panes — and its position beside St. Paul's. Yet Nouvel has been nothing if not sympathetic to this favoured location; his reverence to Wren's cathedral at times borders on the slavish. The building's low height mean that it is virtually invisible until you get right up close; standing on Southwark Bridge, a mere five minutes walk away, One New Change is invisible. If, as reputed, the architect took inspiration from a stealth bomber, it was a well-realised influence. It might not be the only reference. When Londonist editor M@ suggested that the building's western aspect looked a little like a pair of legs, waiting to receive the dome of St. Paul's, our guide replied that it wasn't the first time that had been suggested. For an architect whose work has touched on innuendo before (see his Gherkin-like Torre Agbar or the equally phallic new project in Doha), it's probably not a coincidence. 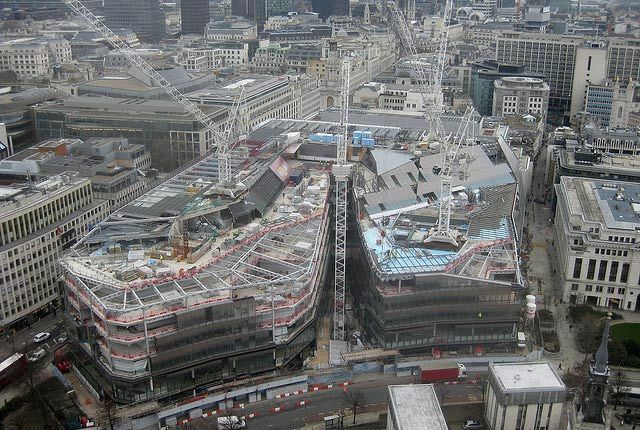 None of this will matter to the thousands of shoppers expected to visit One New Change when it opens. Though the list of stores and restaurants isn't particularly exciting — a selection of High Street favourites, higher-end stores, and with restaurants by Jamie Oliver and Gordon Ramsey — what the project does is offer a focal point for shopping in the Square Mile. 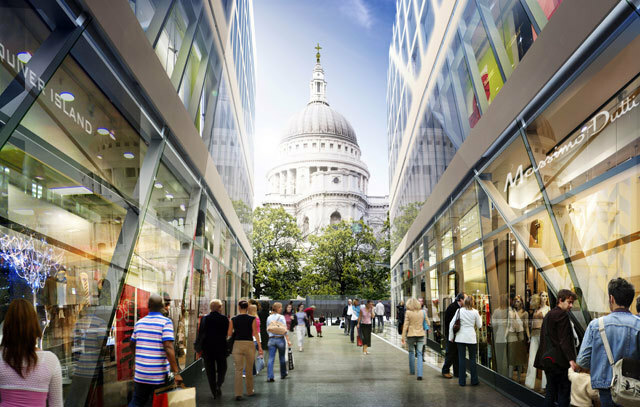 The developers are keen to play up Cheapside's historic role as a market; the word 'ceapan' meant 'marketplace' in Old English, and streets leading off it include Milk St, Bread St, and Poultry. The Square Mile is relatively quiet at weekends, with most shops closed and many bars and restaurants not bothering to open much, if at all. The people behind One New Change are betting that a huge, covered shopping mall, within walking distance of the South Bank and with good transport links, will draw shoppers in. The retail opportunities aren't the only draw here. A sixth-floor roof terrace is open to the public; access is via a glass elevator that offers spectacular views of St. Paul's on the way up, and from the terrace itself, the view of the cathedral's eastern aspect is tremendous. Though we weren't able to see them due to the construction work, a series of mosaics by Boris Anrep and stone statues by Charles Wheeler, that were recovered from the previous building on the site during demolition, will be displayed on the roof. Back on ground level, there are two public walkways that bisect the building from all sides, providing an easy cut-through between Cheapside, New Change, and Bread Street (although this is a 'public' thoroughfare in the modern, restrictive sense of the word, meaning a security guard will doubtless be tapping on your shoulder if you wander in with a B&H hanging from your mouth). Arguments about the building's appearance will continue to be made for and against, but as One New Change approaches completion, the question turns to how successful it might be, and what affect it could have on London. 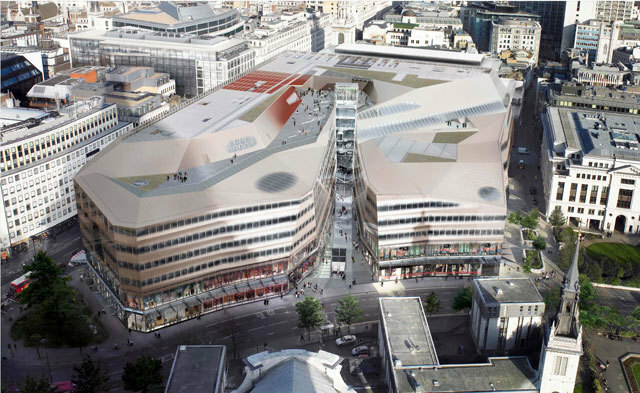 If it works — and the high occupancy rate suggests retailers think it will — One New Change will represent another shopping hub for London, poised between Oxford Street and Canary Wharf; it may even pinch Westfield Stratford's lunch before the latter is even open. The project's success may also dramatically change the way Londoners feel about the City, turning it from a working place seldom visited out of office hours, into a leisure destination. 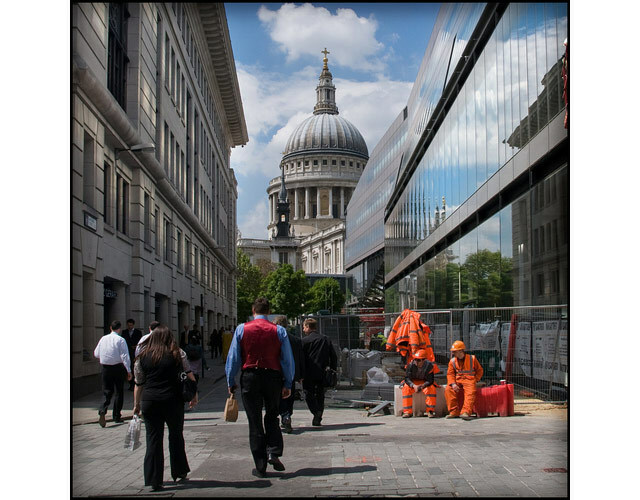 The urban wanderers who treasure the Square Mile's weekend tranquility may not be pleased to hear it, but the market is coming back to Cheapside. One New Change is scheduled to open on October 28th 2010. Jean Nouvel's Serpentine pavilion is in Kensington Gardens until October 17th.